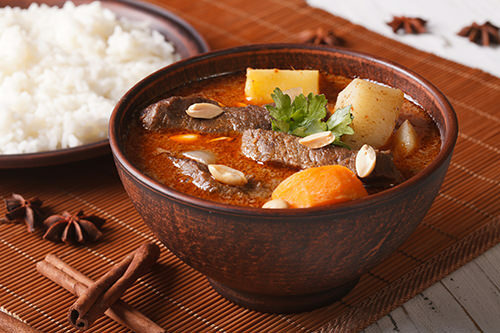 Have you ever wondered how to make a slow-cooked Thai Massaman curry from scratch? I wondered, and I tried various recipes only to be disappointed. Nothing I was making tasted as good as the Massaman curry we’ve eaten in Thailand. The Massaman curries we’ve had on holidays were all rich in flavor, gorgeously fragrant and even had a chili kick. I was also hoping to cook a spicy Thai curry recipe that worked well in the slow cooker. You see, I love my slow cooker. During the week I like to throw all the ingredients into it at breakfast. I set the slow cooker to cook and come home to a completed dinner. The slow cooker is the closest thing I have to a housekeeper/home chef. I started wondering, did I want to make a Massaman Curry from scratch? Or, was my quest to recreate the exotic spicy aromatic flavor of the Thai kitchens in the simplest possible way? When I realized I was trying to perfect a flavor, it made the job of creating the perfect Massamam curry very simple. I started with an Massaman Curry pasteand added everything that was missing from the flavor profile I love. Thinking back to the plastic bags filled with spices and curry we would buy from the Thai roadside vendors. What made them special? Firstly, they nearly all included peanuts that had been swollen and softened by the cooking process. I had noticed bruised lemon grass stalks and kaffir lime leaves in some of the dishes. The Massaman Curries in Thai restaurants are served with crunchy beans spouts. Best of all the sauce was richer, the flavour included more chill, garlic, cinnamon andstar anise. After some trial and error, I had perfected the slow-cooked Massaman Curry. 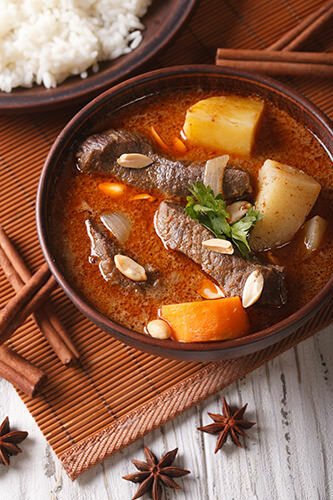 This massaman curry is a simple recipe to make as all the ingredients are added to the slow cooker at the start. There is no need to brown off the meat or onions. The long and low cooking temperatures of the slow cooker allow the meat and potatoes to get to that delicious falling apart stage. 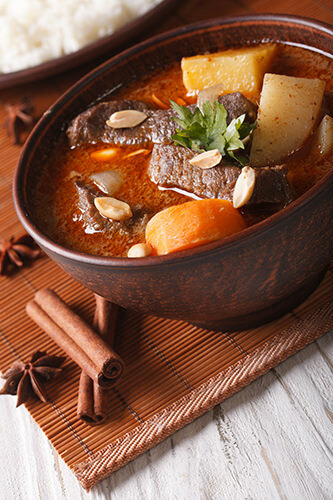 This delicious Massaman Curry Recipe is a traditional all-time Thai favourite. Cooking this spicy dish in the slow cooker allows for tender beef and allow the aromatic spices to infuse deeply into the meat. Add all the Massamam curry ingredients to the slow cooker. Turn the cooker to the low setting and allow it to cook for a minimum of 8 hours. When your ready to serve remove the cinnamon and star anise. Serve the slow cooked macadam curry with rice. Add the toppings to each individual bowl or place on the table for people to add there own. You could quite easily leave out the toppings I have suggested for the Slow Cooked Massamam Curry and still have a delicious, simple meal. I only add one chilli in the slow cooker because I’m cooking for children. This recipe to serve six adults.